Why are protesters targeting Mong Kok? Jump to media player The BBC's Celia Hatton reports on why pro-democracy protesters in Hong Kong see the Mong Kok district as key to their movement. Minor scuffles in HK night protests Jump to media player Pro-democracy demonstrators in Hong Kong have clashed with police as they return to the streets in the Mong Kok district, just hours after they were cleared by the authorities. Hong Kong confirms student talks Jump to media player Carrie Lam, Chief Secretary of Hong Kong, has confirmed that the government will meet with pro democracy students leaders on Tuesday for talks. 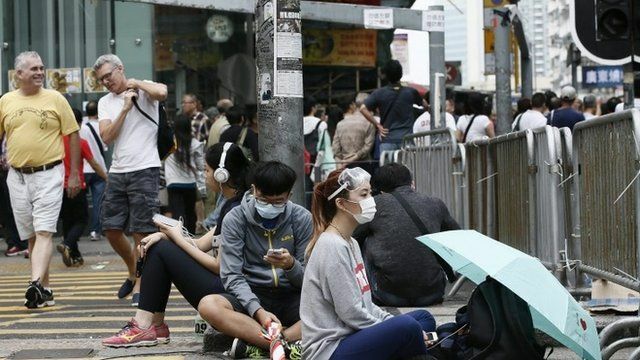 'Illegal acts are hurting Hong Kong' Jump to media player Hong Kong's police commissioner has condemned overnight protests which saw demonstrators retake streets in the Mong Kok district which had been cleared by the authorities a few hours earlier. Hong Kong protesters strike back Jump to media player Democracy activists in Hong Kong have reoccupied some of their protest camps, amid violent clashes with police. Police pepper spray HK protesters Jump to media player Fresh clashes break out between protesters and police in Hong Kong, with some officers using pepper spray. Riot police clear HK protest site Jump to media player Police in Hong Kong have used cranes to clear road blocks erected around a major protest site. Hong Kong protests: Why is Mong Kok important? Student leaders in Hong Kong are calling on supporters of the ongoing pro-democracy movement there to resist using violence when confronting police. Their plea comes after several nights of clashes between demonstrators and riot police at the second-largest protest site, in the Hong Kong neighbourhood of Mong Kok. But why do the protesters think the Mong Kok site is so important? The BBC's Celia Hatton reports.